Tim Burton's latest film, Frankenweenie, has its roots in the earliest days of the director's career. Burton directed the original live action short of Frankenweenie in 1984 whilst working as an animator for Disney, and it was intended to accompany screenings of Pinocchio when it was re-released that year. The short was ultimately deemed too dark and Burton was fired from Disney for using company money to make films that they did not consider to be suitable. There's a certain delightful symmetry in Burton making a feature-length version for Disney nearly three decades later, especially since the new version seems to find him regaining some of the spark that has eluded him in recent years. Victor Frankenstein (Charlie Tahan) is a kid obsessed with movies and science. Growing up in an endless, sterile suburban part of the town of New Holland, his only real friend is his dog Sparky. Whilst Victor is happy with this situation, his father (Martin Short) is worried that he'll grow up 'weird' if he doesn't do things that are more normal. He suggests that Victor spend some time playing baseball in exchange for allowing him to take part in the annual science fair. It's a simple arrangement which has the unexpected and tragic consequence of Sparky getting run over by a car whilst chasing an errant ball. Distraught over his pet's death - and inspired by a creepy but good-natured science teacher (Martin Landau) - Victor sets about using the unusually frequent thunderstorms around New Holland to bring Sparky back to life. Getting the posthumous pup up and running again proves to be the least of Victor's problems, though, since he must now keep his dog and his methods a secret from the townspeople. Filmed in gorgeous black-and-white and using the same sort of stop-motion animation he used on Corpse Bride, Frankenweenie is a lovely tribute to the films that Tim Burton adores and which inspired him to become a film-maker. As in the original short, the film begins with Victor's parents watching a monster movie he has made starring Sparky as a city-stomping creature (albeit a cute and cuddly one) and there's a clear love of the physical properties of film evidenced by the scratch lines and the way the film accidentally burns at the end. Much as in the case of Martin Scorsese's wildly over-rated Hugo, there's something interesting about a film-maker celebrating the joys of celluloid in a film which was shot digitally and is being shown in 3D (though Frankenweenie doesn't lose sight of the need to tell an engaging story or descend into a mawkish film preservation lecture) and Burton makes full use of the format to create depth around his characters. As with Henry Selick's Coraline, one of the few films to really make great use of 3D, it actually augments the physicality of the model work, creating the impression of watching some sort of magical puppet show. It's not essential, since the animation is seamless enough to work on its own, but it's an intelligent use of the format that feels natural. It also highlights the design of the film, which is really stunning, by drawing attention to the bizarre curves of the characters and the rigid straight lines of their homes. Burton's an expressionistic director, and animation plays into that tendency wonderfully by allowing him to design characters whose personalities are etched into their bodies. Aside displaying a love of film itself, the story is infused with the spirit of classic horror cinema. The premise is obviously rooted in James Whale's version of Frankenstein (with a cute visual gag referencing its superior sequel, The Bride of Frankenstein) and Burton and screenwriter John August sprinkle references to other classic Universal horror films in along the way. Fans of the genre will spot nods to Dracula and The Mummy, whilst the middle act of the film also finds time to reference Japanese monster movies for good measure. Crucially, none of these references overwhelm the story itself, which is simple, elegant and works perfectly well for anyone who hasn't seen all the films being alluded to. It's clear that Burton knows and loves this material, but he's a deft enough storyteller to know that homage can feel awfully hollow if there isn't something solid to anchor the winks and nudges. 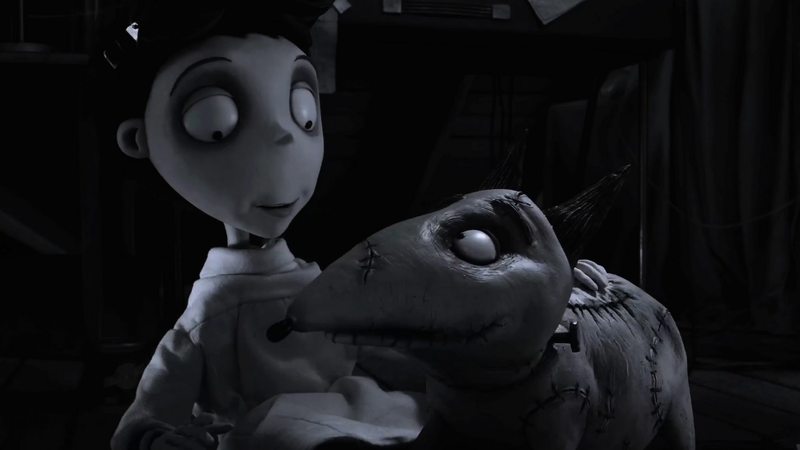 The anchor for Frankenweenie is the relationship between Victor and Sparky, which is incredibly sweet, and the palpable sense of loss he feels from Sparky's death. It's a story about a boy who loves his pet so much that he can't let him go, and much as in the case of Shelley's "modern prometheus," his meddling with forces he can't comprehend leads to disaster. Well, a mild and accessible disaster: No little girls get strangled and thrown into lakes in Frankenweenie. Even though there's a generally quite breezy tone to Frankenweenie - traumatic death of a beloved pet aside - it all comes back to loss, death and, in the film's most moving scene, acceptance. It's painfully human in its approach, and it keeps things grounded even during the film's messy middle-section, when less scrumpulous characters use Victor's techniques for their own ends. This part of the film also suffers from being obviously padded to stretch out the running time, in the process muddling the conceptual simplicity of the film by changing it from a Universal horror pastiche to an all-purpose horror/sci-fi one. It rights itself for the home stretch, with mere minutes to spare. Much like the films it emulates, Frankenweenie is beautiful in its earnestness. There is none of the cynicism or commercial calculation that has marred everything Burton has made since Big Fish, and it's the closest he's come to achieving the mix of wry humour and aching sincerity that characterised his best work for some time. Certainly compared to the likes of Alice in Wonderland and Dark Shadows, it's a masterpiece, but even with its flaws Frankenweenie is the best thing Burton has made in a decade. It's a shame that the film looks likely to be one of his less commercially successful, lending belated weight to the claims of those who said that the concept is just too dark to be commercial. Audiences be damned: Tim Burton has finally made another odd, beautiful film, one worthy of the oddball visionary that made Beetlejuice, Edward Scissorhands and Ed Wood. Here's hoping that going forward it proves to be the rule, rather than the exception.